Want to sharpen your golf skills while playing with your dog? 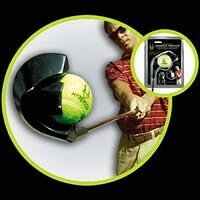 The Hyper Doggie Driver swings like a regular golf club and can launch a tennis ball up to 100 yards. You don’t even need to pick up the tennis balls — you can push the opening of the club against the ball to reload the driver (it’s like having your own caddy). Work on those skills and you’ll be in a PGA championship in no time. Just remember, no throwing the golf club around when your dog is next to you, and always make sure your dog is out of harm’s way. This entry was posted on Friday, June 1st, 2007 at 3:54 am	and is filed under Dogs, National Dog, Cat & Pet Info, Products & Services for Cats & Dogs. You can follow any responses to this entry through the RSS 2.0 feed. Both comments and pings are currently closed. geez, I have to be careful not to whack my dog in the face with chuckit stick when I’m throwing the ball now, & it’s the short version. wonder how many dog eye, teeth & face injuries will happen with this thing!